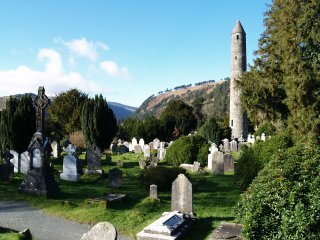 The Round Tower at Glendalough (the glen of the two lakes), County Wicklow, the monastic settlement that dates from the 6th century. 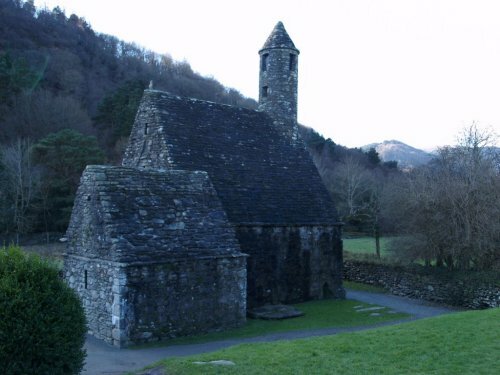 The life and work of St Kevin (died 612AD) who founded the monastery, is always associated with this early Christian settlement. 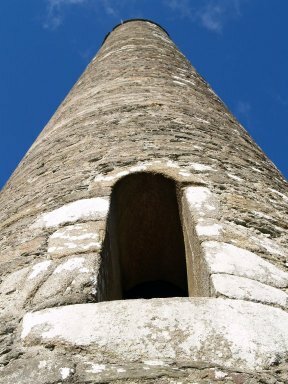 Looking up the side of the Round Tower at Glendalough. You got in via a ladder through the small door and pulled the ladder in after you, hopefully to survive the raiding Viking attacks. 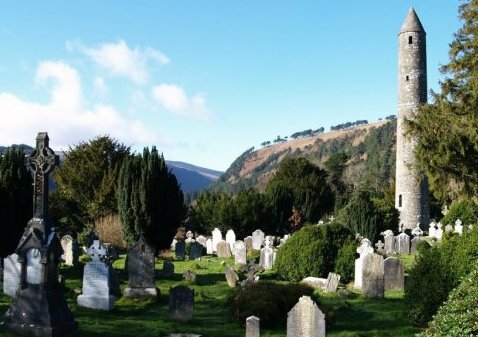 The Round Tower at Glendalough and the remains of one of the churches. 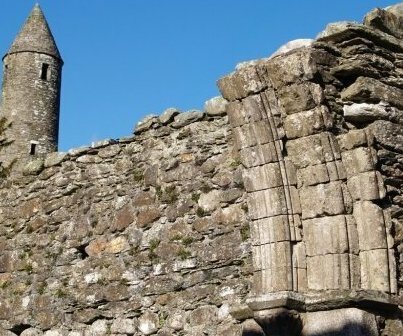 A few fragments remain of the wonderful stonework that once formed part of the church structures of this very early Christian community at Glendalough. 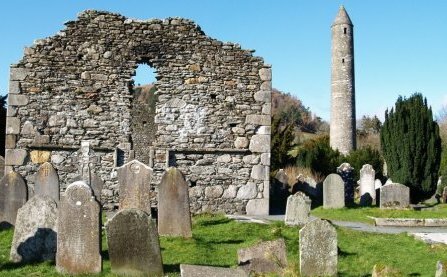 The surviving buildings date from the 8th-12th century, and after the end of the 14th century the settlement fell into decline. 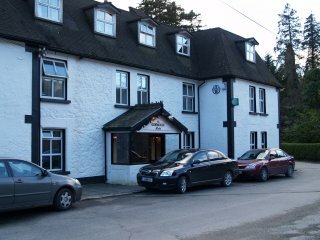 The Glendalough Hotel for some refreshment before driving on. - very nice meal and friendly service. 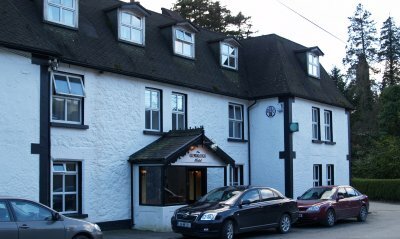 Glendalough, Co. Wicklow, Eastern Ireland: The Glendalough Hotel, Glendalough, County Wicklow, Ireland, serves this very popular tourist destination. 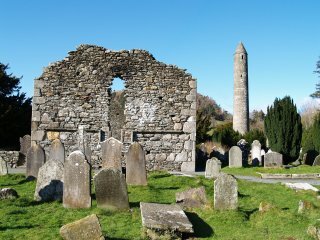 The Round Tower is impressive, set amongst the ruins of the early Christian community. Its a very atmospheric place and several good walks are available to the various sites of interest AND good drive out from noisy busy grid-locked Dublin! 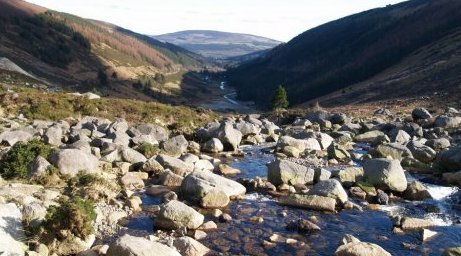 Looking up the Wicklow Gap away from Glendalough towards the Wicklow hills in County Wicklow. Looking down from the Wicklow Gap towards Glendalough, Co. Wicklow on this wonderful scenic drive. Skirting round from the Wicklow Gap passed the reservoir at Pollaphuca and on towards the Sally Gap. The reservoirs were formed by damming the lakes to supply Dublin's domestic water. 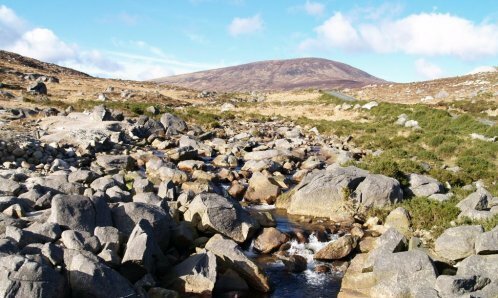 The Wicklow Hills and Mountains near Sally Gap - quite a wild and remote spot on this scenic trip. 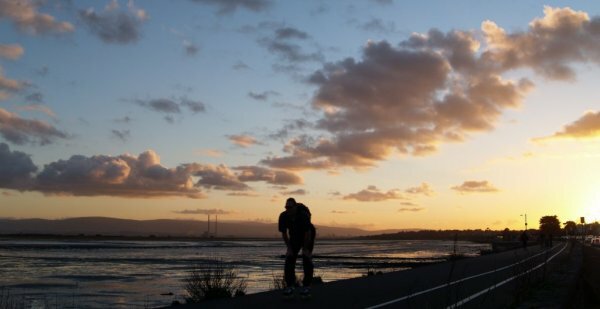 Finally, after crossing from the south to north of Dublin City, we experience a Dublin sunset over the power station at Dublin Port and the Wicklow Mountains, seen from the Clontarf-Sutton Cross road as a skate boarder flashes by!